MEXICAN TILE KITCHEN, DINING ROOM WHICH OPENS ONTO A PLANT FILLED PATIO. SHORT AND LEVEL WALK TO CAFES, SHOPS, GALLERIES AND EVEN A CINEMA. YET OURS IS A LOVELY PEACEFUL RESIDENTIAL STREET. THE WATER THRUOUT THE HOUSE IS PURIFIED. THE PATIO IS WELL FURNISHED WITH LOTS OF SEATING AND A LARGE TABLE. THERE IS ALSO A PALAPA(COVERED PATIO) UPSTAIRS. AND ART AND LANGUAGE SCHOOLS. 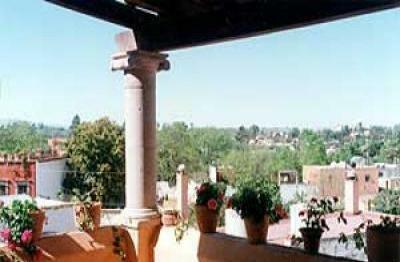 SAN MIGUEL HAS MANY EXCELLENT RESTAURANTS, CAFES AND BARS. LOCALS, CHILDREN, BALLOON VENDERS, AND MUSICIANS.